If there was ever a week when I needed a 7 Quick Takes Friday, this is it. Once again, I owe a debt of gratitude to Jennifer at Conversion Diary for starting and hosting this weekly carnival. I’m happy to report that my birthday improved 100% after my whiny post the other day. The kids came home from school, breathless with excitement over “Mom’s birthday.” It’s hard to be in a snit when your kids are giving you hugs every few minutes and watching your every grumpy movement with shining eyes. Teyla took a short nap, which enabled me to bake one of my favorite cakes. Corey came home with mysterious bundles and escorted the quivering children upstairs for help with the secrets; that gave me almost 40 minutes BY MYSELF to throw together some lasagna soup, heat some baguette and finish the cake. They each got me a perfume sample, by the way. And Corey got me a boxed set of the perfume he liked the most, with the stipulation that I use the sample vial first so I can decide if I like it as much as he does. But the best birthday present by far was the news that my Mom does NOT have cancer. (Sorry; I haven't mentioned anything about this until now to protect my parents' privacy.) She was in surgery the morning of my birthday, due to some ominous test results. When the doctor came out and said he could find no evidence of malignancy, the day when from uncertain to glorious. We are so thankful for God’s mercy. Can you feel colder than numb? So asks my favorite local meteorologist. The answer: I don’t know. I can’t feel anything anymore. It’s -21 here this morning. Air temperature. Wind chill is in the -35 to -45 range. When I took Natalie and Connor to school this morning, the air around us shimmered with so-called “diamond dust,” ice crystals that spontaneously form mid-air on the coldest of days. The sun shined so bright, the sky was so blue, I felt like my sinuses were being pierced with light. It’s the beautiful side of evil. On the other hand, I no longer have to worry about black widows living in my back yard, like I did when I lived in San Diego. And now they have brown widow spiders to worry about. I guess that’s the evil side of beautiful. We were supposed to leave for a week-long vacation in Hawaii tomorrow morning. But now, we’re not going. I’m going to tell the full story right here, sometime this weekend. 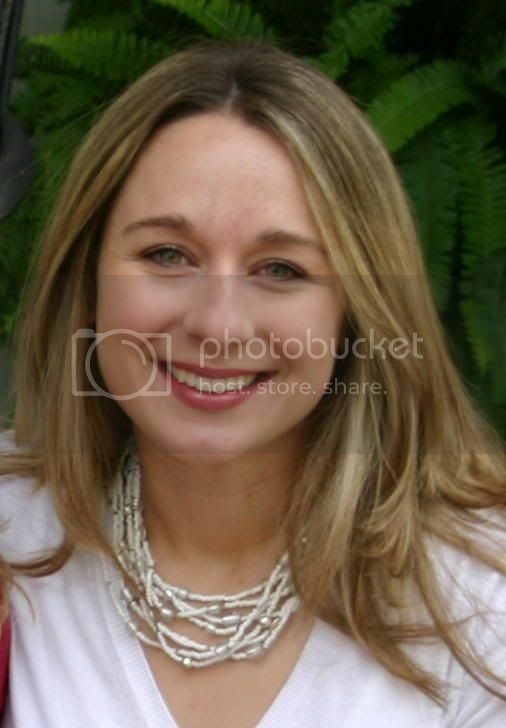 Trivial question: My hair is dark blond. I’ve been highlighting the top for a few years now, but I’ve never done a complete whole-head foil since my hair is unnaturally thick and long. 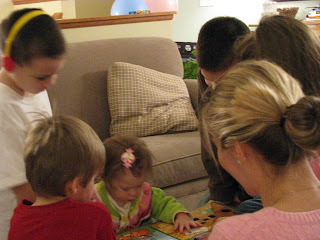 But then I saw this picture of the back of my head at Teyla’s birthday party, and it made me wonder. I'm like a new Batman villain -- Two-Hair: Bright on top but dark underneath. Which is her true color? Is it worth the time and money to highlight the whole shebang? Vote now! Here’s the quote I’ve been pondering this week. The great danger facing all of us -- let me say it again, for one feels it tremendously -- is not that we shall make an absolute failure of life, nor that we shall fall into outright viciousness, nor that we shall be terribly unhappy, nor that we shall feel that life has no meaning at all -- not these things. The dangers is that we may fail to perceive life's greatest meaning, fall short of its highest good, miss its deepest and most abiding happiness, be unable to render the most needed service, be unconscious of life ablaze with the light of the Presence of God -- and be content to have it so -- that is the danger. That some day we may wake up and find that always we have been busy with the husks and trappings of life -- and have really missed life itself. For life without God, to one who has known the richness and joy of life with Him, is unthinkable, impossible. That is what one prays one's friends may be spared -- satisfaction with a life that falls short of the best, that has in it no tingle and thrill which comes from a friendship with the Father. First of all, I'm glad you got some cake. Second, lasagna soup sounds interesting. Third, I'm praising the Lord with you that your mama's okay! Living in TX, I have no tolerance for cold. And I'm wondering: is there a point where cold is just cold? where -32 feels like -22? or does it feel different? Loved reading these. Thanks for participating! My hands can barely type thinking about how cold it is up there. Every time I see a news report of the frigid northern temps, I think of you. SO SO GLAD your mom's surgery came out with a good report. What a great birthday gift indeed! Teyla's video is adorable. (No surprise there!) Although I will admit my heartrate sped up just a bit when I considered the fact that she could suddenly decide to turn around and take a dive toward those stairs! You'll have to share the recipe for the lasagna soup. I'm intrigued. 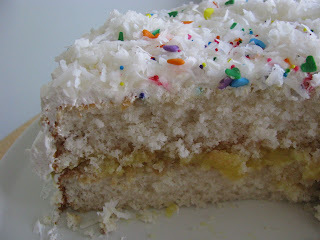 And the cake looks wonderful, although my kids would hate the coconut! Glad to hear your birthday improved. Praise God for what the doctor didn't find. As for the hair, why not just dye it all the same shade of blond? Seems to me that would be easier than highlighting all of it. I don't think it looks bad like it is, after all, if it were true highlights, the underside of your hair would still be dark since the sun wouldn't reach it. I think it is HILARIOUS that you were baking your own birthday cake and birthday dinner!! And it was a break for you!! I totally, totally get it, and I think it's hilarious. That cake in the picture looked FANTASTIC. I am also rejoicing with you about your mother. PHEW!! In California, the hair color you are sporting is in style. Blonde on top, dark underneath? TOTALLY a cool look. Trust me. If you want to embrace it, I would darken the dark, though, and brighten the blonde. Just a thought. OR you could go dark all over and then do new highlights on top. There are so many fun, attractive things you can do with color! I love the sound of Teyla breathing as she crawls across the floor. Priceless. Glad your birthday got so much better and am joining you in praise re: the good news about your mother. That's a great quote, and related to why I live where I do. And we have the same colour hair! Even if you don't colour it, does it always bleach out a bit, so that you always have darker roots and lighter ends, esp when you lived in Calif? That's how mine is. I think it would look cute if you streaked the dark part a little, but I also thinks it look okay the way it is. Wow, love the video...what a difference a couple of weeks makes. Last week she was toddling around confidently...next week marathons? Oh wow, I'm behind--I missed your birthday. Happy Belated! Lasagna soup--that sounds like a needs to share recipe. The story on your mom within its privacy limits sounds needs to share. And definitely to Hawaii and now not to Hawaii--soooo needs to share. My hair looks like that (light on top, dark underneath) and I don't highlight it at all!